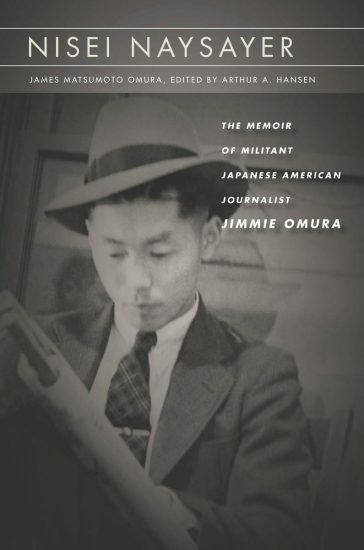 An author discussion with Arthur Hansen, editor of “Nisei Naysayer: The Memoir of Militant Japanese American Journalist Jimmie Omura” (Stanford University Press) will be held on Saturday, Aug. 25, at 2 p.m. at the Japanese American National Museum, 100 N. Central Ave. in Little Tokyo. The late journalist James Matsumoto Omura (1912-1994) was among the fiercest opponents of the mass incarceration of Japanese Americans during World War II. In his sharp-penned columns, Omura fearlessly called out leaders in the Nikkei community for what he saw as their complicity with the U.S. government’s unjust and unconstitutional policies ― particularly the federal decision to draft imprisoned Nisei into the military without first restoring their lost citizenship rights. In 1944, Omura was pushed out of his editorship of the Denver-based Japanese American newspaper Rocky Shimpo, indicted, arrested, jailed, and forced to stand trial for unlawful conspiracy to counsel, aid, and abet violations of the military draft. He was among the first Nikkei to seek governmental redress for wartime violations of civil liberties and human rights. In this memoir, which he began writing towards the end of his life, Omura provides a vivid account of his early years: his boyhood on Bainbridge Island; summers spent working in the salmon canneries of Alaska; riding the rails in search of work during the Great Depression; honing his skills as a journalist in Los Angeles and San Francisco. By the time of the attack on Pearl Harbor, Omura had already developed a reputation as one of the Japanese American Citizens League’s most adamant critics, and when the JACL leadership acquiesced to the mass incarceration of American-born Japanese, he refused to remain silent, at great personal and professional cost. The book is edited and includes an introduction by historian Hansen, professor emeritus at CSU Fullerton, who will discuss the book and his friendship with Omura, and features contributions from activists and writers Frank Chin, Yosh Kuromiya, and Frank Abe. Included with museum admission. RSVPs are recommended. For more information, call (213) 625-0414 or visit www.janm.org.